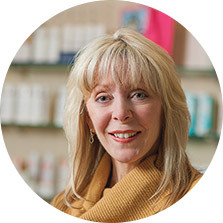 A certified Reflexologist with experience in fitness, wellness and complimentary healing, Carole has experienced firsthand the powerful benefits of Reflexology. She first turned to Reflexology when seeking relief for her own health issues and found it so effective she dedicated herself to helping others through its application. Carole obtained certification for Reflexology in 2008. Carole is a firm believer in taking charge of your own health. She helps others manage the chaos of life and develop personalized solutions that improve health and wellness through both Reflexology and as a certified Reiki Master.